It is not uncommon for our pet cats to reach at least the age of 15 now due to a combination of advances in veterinary care and improved nutrition. As cat owners we can also contribute by keeping a close eye on the health and behaviour of our cats, especially as they become older. As your cat ages being aware of potential health issues and ways you can support your cat in their advancing years will help to keep them as healthy and happy as possible during their later years. WHAT AGE GROUP DOES MY CAT FALL INTO? Cats, like humans, will age at their own individual rate, but as a guide cats are thought of as mature between the ages of 7-10, senior at 11–14 years and super senior when they are over 15 years. As an idea, these ages relate to human ages of 44–56, 60–72 and over 76. For this reason, it is easy to understand why our older cats need more regular veterinary care – the same is true for owners! Cats will experience the same general challenges as they age that we do – their bodies become less able to cope with physical or environmental demands, their immune system weakens and they are more likely to develop age related diseases. Sometimes it can be difficult to separate changes seen due to an expected slowing down compared to those associated with disease. Regular wellness checks are important to help distinguish which changes are related to the onset of illness. Due to the rate cats age these checks should be yearly for mature cats but they should increase to at least twice a year for cats in the senior and super senior age groups. 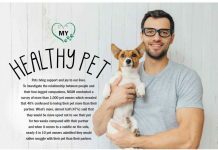 The sooner a health issue is spotted, the better the chance of managing and treating the condition which will benefit the long term wellbeing of your cat. Remember, your cat is an expert at hiding illness; they can appear healthy for a long time but then suddenly show an illness once they are no longer able to compensate for the underlying disease. 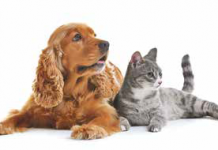 A partnership between you and the veterinary team makes it easier to spot the clues that underlying health issues are occurring and to discuss the best way to support your cat when managing and treating these issues. Your vet can screen your cat for a variety of age-related concerns. This can be via a form to gather information about any changes you have noticed at home, a physical examination as well as blood pressure measurement. Regular laboratory tests can check your cat’s urine and blood for changes related to common age-related diseases such as kidney disease, hyperthyroidism and diabetes. Exercise: Whilst older cats may sleep more they still benefit from interaction with you and a stimulating environment to keep their mind and body active. They may spend less time outdoors, so keeping them active indoors by encouraging play with toys or using active ways of feeding, such as activity feeders or encouraging your cat to work for their food by scattering kibble can really help your cat. When playing with an older cat, being mindful of shorter, but possibly more often play times in the day, will help them if they are becoming less agile. If your cat has always loved being up on a window sill or has a favourite spot on a cupboard, it may be that you need to move a few things around so that it is easier for your cat to get up and down from these elevated places. Comfortable bedding (and possibly some warmth from either a heat mat or warm bottle under the bedding) in these areas is often appreciated. Diet: Diet plays an important part in keeping older cats active and healthy. Good nutrition may slow down or delay some ageassociated changes and can help to prolong healthy life. There are many commercial foods designed for older cats and your veterinary clinic or pet shop will be able to advise you on a food that suits your cat. Weight changes can go unnoticed over time and may be difficult to notice in longer haired cats. Monitoring weight and body condition score regularly is therefore important and should be noted at each health examination at the vets. Body condition scoring assesses the body type of the cat on a scale from 1 (very underweight) to 9 (very overweight) by looking at the body shape of the cat and how prominent the cat’s ribs, spine and ‘waist’ are. Mature and senior cats are more prone to being obese – if you have a cat that needs to lose weight the team at the veterinary clinic are there to help you with an individualised plan for your cat. Older cats may eat less as their sense of smell deteriorates, but they may also have teeth or gum problems and their digestive system may also work less effectively. 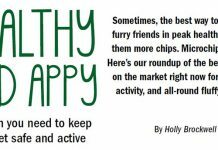 If your cat has a change in their sense of smell heating food, or using more ‘smelly’ foods may help. Dental disease is a painful condition which will affect your cat’s ability to eat, but can also have an impact on other organs in the body. As older cats can become constipated providing a variety of drinking options in the home is beneficial, ensuring easy access both upstairs and downstairs. Consider how your cat prefers to drink – do they like a wide bowl, water fountains or perhaps a dripping tap. Any changes in the amount your cat drinks should be reported to your vet as this could be an important clue that your cat has an underlying health problem. Litter trays: Consider providing additional litter trays in other parts of the home so that your cat has easy access to a tray regardless of where they are. Cats with arthritic changes may find having a lower side to their litter trays helps them to get in and out of the tray. Whilst sudden changes should not be to the litter used in the tray, an older cat may find a finer litter more comfortable on their paws. If you notice any changes in the use of the litter tray (such as the tray requiring cleaning out more regularly, or changes in your cat’s faeces) please let your vet know as it could help in working out any underlying problems. Limit stress: Most cats prefer to have a routine, but a consistent daily routine can help older cats cope as they may be more sensitive to anything new or different in their environment. Your cat may become more vocal as they age and may be more fearful of strange or loud noises or unfamiliar items or people in the home. However, they may also become more active and irritable which can be signs that they are developing an underlying problem such as hyperthyroidism. Irritability can also be a sign that they are feeling painful. 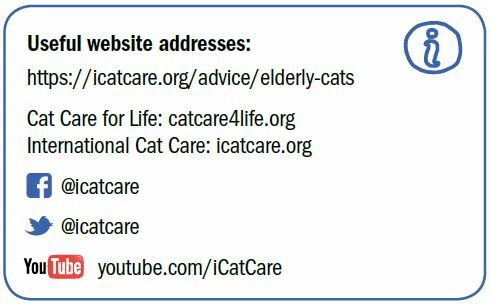 There are many ways owners of senior cats can help their cat during their ‘golden years’. 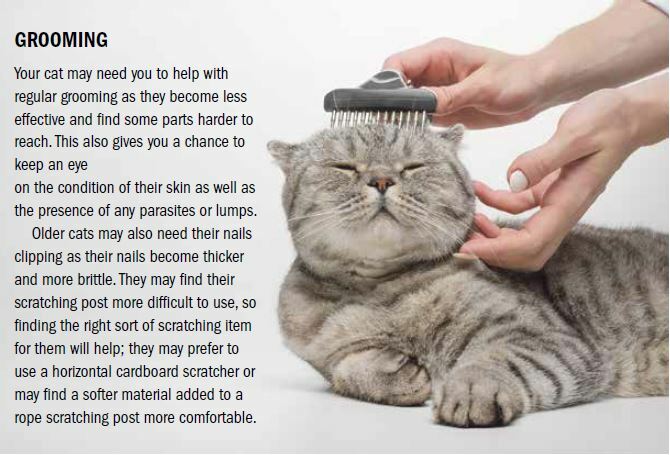 Making minor changes, such as creating smaller ‘steps’ to a favoured elevated resting place, or purchasing a litter tray with a shallower depth, can make a world of difference to older cats. It is also important to keep an eye out for any changes you notice, so that you can discuss these with your vet and help to diagnose any developing health problems as soon as possible.